The future is on the horizon, and Daimler Trucks North America wants it to arrive as soon as possible via vehicles that are safer, more fuel efficient, and automated. 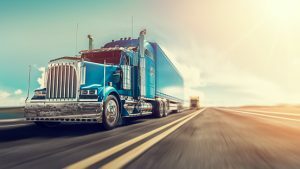 The Portland, Oregon-based company said it doesn’t expect self-driving commercial trucks “in the near future,’’ but it does believe some automation may be practical well before that. Most importantly, this means using technology to warn of potential collisions or to pair trucks on the highway to improve efficiency. Daimler is already testing this pairing (also called platooning) of trucks on Interstate 84 and at its test track in Madras, Oregon. “Pairing is the next level in vehicle automation, where we look at using not only the steering systems and the emergency braking systems, but also the vehicle-to-vehicle communications,’’ said Derek Rotz, director of advanced engineering for Daimler. Daimler said it plans to ship 30 electric semi trucks this year, but doesn’t plan to begin regular production until 2021. According to Oregon Live, the trucks Daimler displayed in June were nearly silent, “a dramatic contrast to diesel’s traditional rumble.’’ The company said the trucks have ranges of 230 to 250 miles and can recharge 80 percent of their battery in 60 to 90 minutes, depending on the model. Daimler said it believes there is a market for these trucks in short-haul routes within cities – to and from a port, or on a delivery route. The company says it will invest millions of dollars to develop an automated trucking research headquarters on Oregon’s Swan Island. Even fairly basic automation could significantly reduce collisions, according to Roger Nielsen, chief executive of Daimler Trucks North America. He expects that the German parent company will introduce its technology in the United States first. This technology has the potential to reduce the risk of catastrophic truck accidents on Oregon roadways. In 2016, almost 4,000 people died in large vehicle crashes. Sixty-six percent of them were in cars and other passenger vehicles. The number of motorists who died in large truck crashes jumped 27 percent higher in 2016 than in 2009. If you have been injured in a truck accident, contact Zbinden & Curtis, Attorneys at Law, in Portland, Oregon for a free consultation.